FCC Class B Part 15 operation. can also be used to power the CS, when used in a more permanent location. 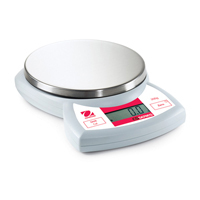 Features Easy operation with two clearly marked buttons, low battery indicator and auto shut-off feature to conserve battery life, mechanical and software overload protection to protect weighing cell from damage, external push button calibration (calibration masses not included).